The Countdown to Thanksgiving is ON. And we’re still finalizing our menu. While our menu automatically includes turkey, sweet potatoes, gravy, and cranberry sauce, our family always has a discussion about one menu item. My mom grew up eating a traditional Greek stuffing that was a combo of wild rice, chestnuts, and currants that was baked in a dish in the oven. My dad grew up with the boxed stuffing cooked in the turkey itself. When my parents got married and started their Thanksgiving traditions, we would have both (the traditional stuffing at my aunts and the Greek stuffing over the weekend with my grandmother). One Thanksgiving a couple years ago, we were having Turkey Day at home because #workschedule. And my mom made bread stuffing that she baked in a muffin tin. And it was glorious. I changed it up last year and served Cornbread Stuffing at Thanksgiving. But this year, I wanted something a little different. Because we are heading on the road this holiday season. 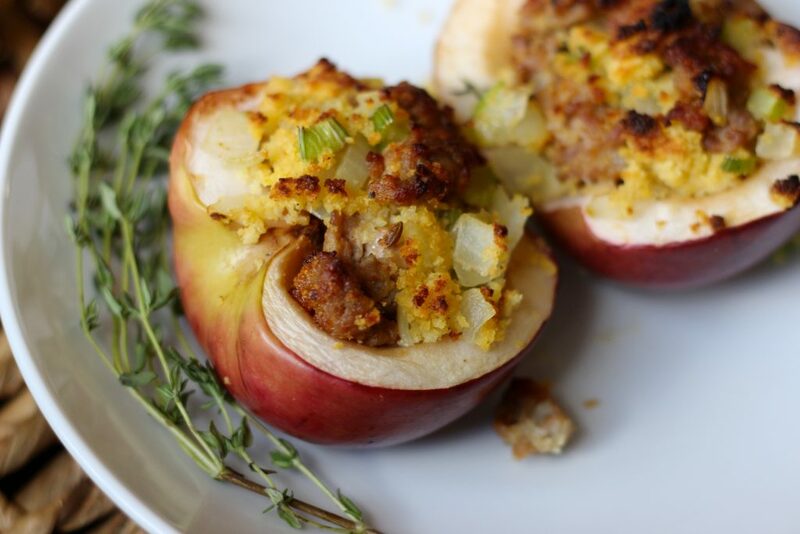 So Savory Baked Stuffed Apples came to the rescue. They are sweet. They are salty. They are perfectly portioned. They can be made AHEAD OF TIME! They are going to be your crew’s new favorite holiday side. It starts with browning up two links of sweet Italian sausage (casings removed) in a skillet. As the sausage cooked up, I used the edge of a spatula to break it into smaller pieces. When the sausage was all cooked, I removed it from the pan and placed it on a paper towel-lined plate to drain. 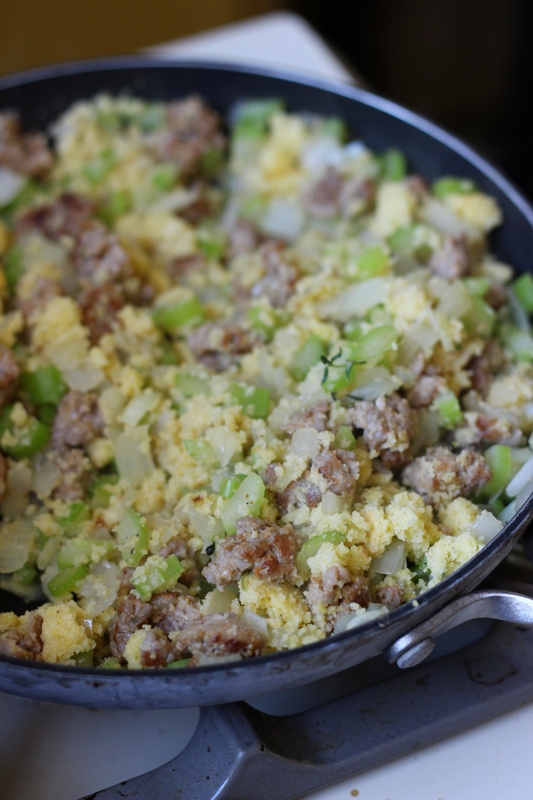 In the skillet with the sausage drippings, add in some diced onion and celery. Cook the veggies until soft and lightly golden. Season with a little salt, pepper, and fresh thyme. Add the sausage back into the skillet with the vegetables. And add in some crumbled stale cornbread. I like making a pan a day or so before, having some for breakfast, and then using the leftover in stuffing. If the cornbread is a little too moist, crumble it up and pop the bread into the oven while it preheats. It should dry out sufficiently that way. Assess the moisture of the mixture and add just enough low-sodium chicken broth until the mixture is moist and “packable”… it should be able to form a loose ball if squeezed together. You don’t want the mixture too soggy because the apples will release some liquid as well. Soggy stuffed apples are gross stuffed apples. Now grab your apples. Use a firm, yet sweet baking apple – I am a huge fan of Cortlands. They are the perfect size and perfectly sweet/tart for a savory stuffing. 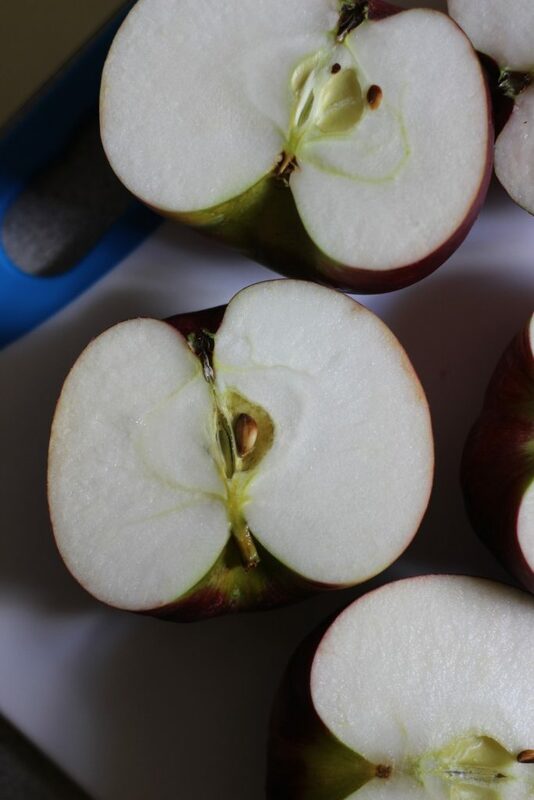 Halve the apples and then use a spoon to remove the core and most of the inside apple bit. 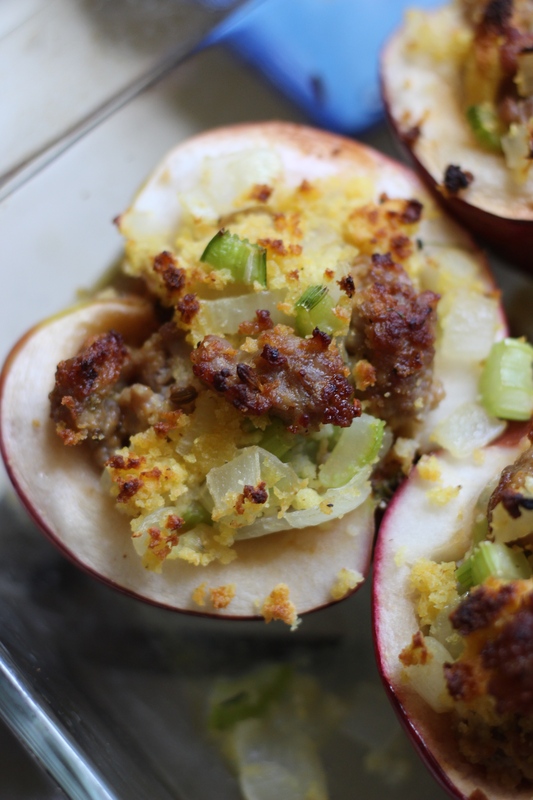 Stuff the apples generously with the stuffing – be sure to mound it high! Splash a little water on the bottom of a lightly greased baking dish and then pop the stuffed apples into the dish. The water and the grease will prevent the apples from sticking/exploding in the oven. Bake the apples at 350 degrees for 15-20 minutes until the apples are tender and the stuffing is golden brown. The best part? You can totally make these the morning and reheat them at the last minute. Which means a lot less stress when getting your Thanksgiving (or Friendsgiving) Feast together. So, are you guys getting as excited for Turkey Day as I am? Simply A (RD) Foodie: Did you know that apples are a great source of dietary fiber? Preheat your oven to 350 degrees. Spray a 9x13 baking pan with cooking spray. Barely cover the bottom with water. Set aside. In a large skillet set over medium heat, add in the sausage. Using a spatula, break the sausage into large crumbled and brown thoroughly. When the sausage is browned and cooked through, remove to a paper towel-lined plate. 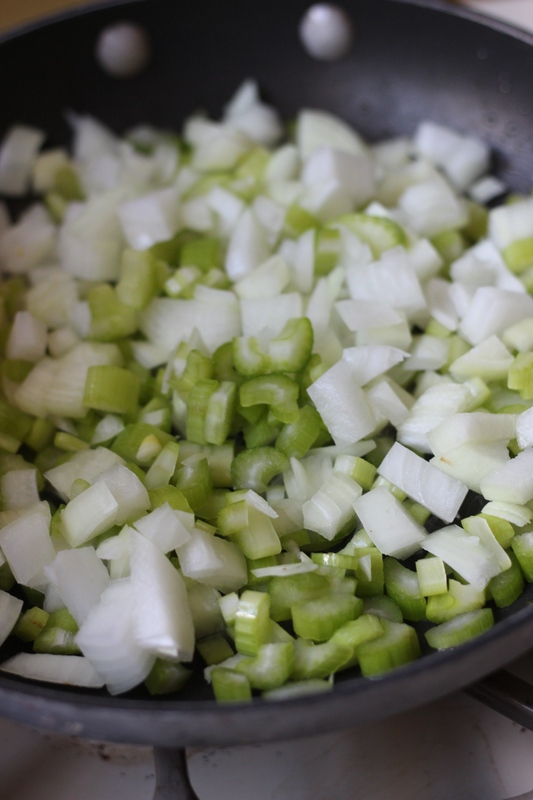 In the sausage drippings, add in the onion and celery. Cook for 2-3 minutes until soft and translucent. 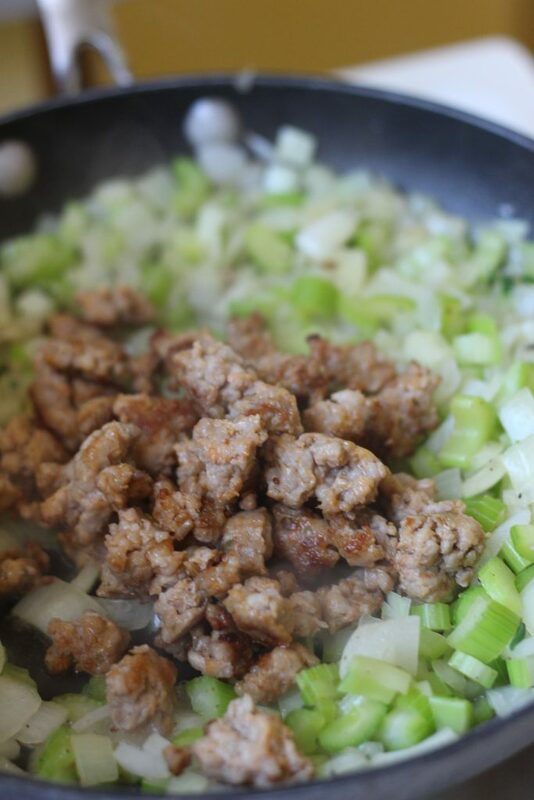 *if there are no sausage drippings, add 1-2 teaspoons of olive oil for cooking. Add in the salt, pepper, and thyme leaves - stir to combine. Taste and adjust seasonings as needed. Add the sausage back into the veggie mixture. Add the crumbled cornbread into the skillet. Carefully stir everything to combine. Pour the chicken broth over the cornbread - starting with ¼ cup of broth and adding more until the cornbread is moist (but not soggy!). Stir to completely combine. Stuff the apple halves with the stuffing mixture, making sure to really create a mound on the top. Place the stuffed apple halves into the greased baking sheet. Bake for 15-20 minutes until golden brown. This can be made ahead of time and reheated before dinnertime!